Located in the northwest corner of Montana, a cluster of quiet, history-laden, affordable small towns is attracting quite a bit of attention as a desirable and affordable place to retire . In fact, the largest of these, Kalispell, a village of about 20,000, was recently named, along two other Montana towns, Bozeman and Helena, as being among America's top ten "dreamtowns," selected because of their overall quality of life and affordability. 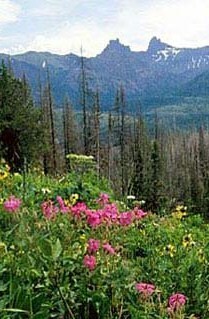 Although this region of the state is somewhat remote and seemingly isolated from the mainstream of America's population centers, Flathead County, which, in addition to Kalispell, includes two other smaller incorporated municipalities, Whitefish and Columbia Falls, boasts an abundance of scenic landscapes and outdoor recreational opportunities. Situated a half-hour from Glacier National Park, and encompassing the vast reaches of Flathead Lake, the grandeur and natural beauty of this region presents aesthetic features and a lifestyle that may be unparalleled anywhere else in America, one that is especially appealing to many retirees who seek a place to retire in the mountains. It is not hard to see why Kalispell and its environs, the fourth most populated in the State, are among the fastest growing of Montana's counties. 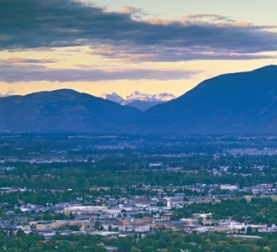 With a population that has experienced a growth rate in excess of 25% over the past ten years, along with a surge in tourism and recreation, the Flathead Valley has transformed itself into a vibrant and stable economy. Along with this expansion, Kalispell and its neighboring small towns are experiencing a steady explosion of new residential developments, with several being marketed to active retirees, including those seeking an affordable place to retire where they can experience an outdoor lifestyle and retire in the mountains. Tucked up in the northwest corner of Montana, the Flathead Valley rivals the world's best in residential and resort living. While most of the 3,000,000 acres of the Flathead Valley is still devoted to vast stretches of timberland and cattle ranches, several of the largest of the ranches are being acquired by developers for residential and recreational use. Yet, development is confined to less than 6% of this total, leaving plenty of elbow room and wide open spaces for active retirees searching for adventurous, outdoor lifestyle. Although certain of the new communities now being built are designed to appeal to an upscale, affluent clientele and feature luxurious, executive-style ski lodges and golf course villas, there are several properties offering affordable places to retire. 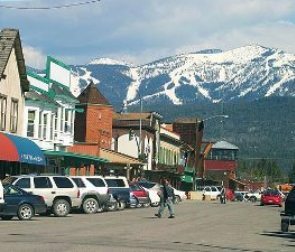 The main communities in the area include Kalispell, the largest town in the Flathead Valley, Columbia Falls, Whitefish and Bigfork, a picturesque, unincorporated village of 1,400 year round residents located along the eastern shore of Flathead Lake. Each of these communities is charming and distinctive in its own fashion. Housing choices range from new, resort-style neighborhoods with golf course lots to sprawling mountainside retreats with spectacular views of the mountains and streams. For some retirees, an older renovated residence in one of the historic towns may be a preferable and more affordable choice for retirement living. Local real estate firms can provide more information on these in-town properties, as well as the lakefront sites or ranch tracts scattered throughout the Flathead Valley. Notable new communities that might be appealing for retirees include Bloomstone and Silverbrook in Kalispell, Tamarack and MeadowLake in Columbia Falls, and Saddlehorn in Bigfork. Spend a little time in any of the picturesque small towns in and around the Flathead Valley, and it doesn't take long to recognize a common thread that runs throughout the entire region. Regardless of the individual neighborhood, there is a distinctive small town atmosphere with a friendly people and an overwhelming community spirit. 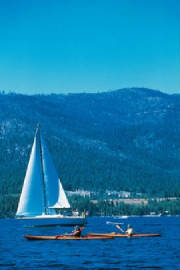 And it is clear that the local folks definitely enjoy their surroundings, whether they are hitting the links on one of the area's eight golf courses, skiing down the slopes of Whitefish Mountain or skimming across the waters of Flathead Lake under the billowing sails of a sleek sailboat. 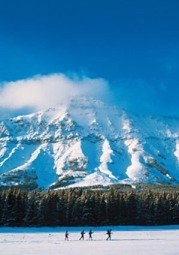 This is truly a year round paradise for adventure seekers, running the gamut from snowmobiling, hiking, mountain biking, canoeing, fishing or just sitting back and enjoying the beauty of the surrounding outdoors. Adding to the quality of life for retirement living are the many outstanding opportunities for arts and culture. With more than 2,000 artists and craftsmen residing in the Valley, and a local symphony and chorale that recently celebrated its 25th anniversary, its reputation as a renowned center for the arts is well deserved. In fact, the charming village of Bigfork has been named as "One of the 100 Best Small Art Towns in the Nation". Considered by most as the art center of the Flathead Valley, Bigfork hosts 12 art galleries, the Bigfork Playhouse and a fascinating selection of shops and restaurants. In fact, throughout the area, there is an abundance of excellent places to eat and a varied and intriguing specialty shops and galleries. True, you won't find the glamour and glitz of more trendy spots like Vail or Aspen, but Kalispell and its neighbors offer a much more affordable place to retire, one that is down to earth, laid back and, all in all, much more hospitable for most people. And though the region is some distance from any large metropolitan area, retirees have ready access to excellent medical facilities and outstanding local doctors from most specialties.